Monster Bash Whether or not your kids have any idea who literary Frankenstein actually is, what matters is that he’s a green scary monster – an icon of ghoulishness, if you will. Start by sending out Mixbook’s Frankenstein invitation to summon spirited friends for a fun celebration. Make it clear that kids can come dressed in any kind of costume, but that Frankenstein or monster costumes are encouraged. Serve up some green-themed treats including a monstrously healthy veggie platter and some cake cones filled with cupcakes or even pretzel sticks. After snacks, let the kids get their hands busy with Halloween feel boxes that look like monsters – and are filled with tarantula legs, mummy toes, monster eyeballs, and – of course – ears of Frankenstein. After their senses are good and grossed-out, queue the kids up for a game of monster beanbag toss. Then, finish of the festivities with some fun crafts they can take home with them, employing none other than Frankenstein-green paint chips. Boo! Ghost Party Gather all your kiddos’ favorite ghosts for a fun day of good-old-fashioned haunting by sending out one of Mixbook’s ghost-themed Halloween party invitations like Happy Ghost or Little Ghosts. Decorate the house by tossing white sheets over all the furniture (bonus: it helps keep things eerily clean! ), then set up a bunch of DIY ghouls. We love the step-by-step versions we found in Country Living Magazine. Serve up some ghostly cupcakes while kids are getting crafty creating spinning spirits. Finish up the festivities with a ghostly game of beanbag toss. Wrap bean bags with white handkerchiefs, and use black Sharpies to make eyes and mouth. Fashion a ghost out of cardboard with cutout eyes and mouth, then spray paint the whole thing white. Kids will love launching their little ghosts for little prizes. Let’s Hang! Spooky Spider Party What’s more chill than “just hanging” with friends? Spin this casual party approach into a Halloween theme by sending out Mixbook’s Hanging Spiders party invitation. 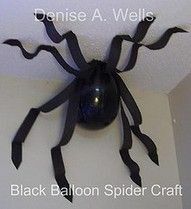 To decorate for the occasion, simply get half-a-dozen black balloons, tape them to the ceiling, and suspend eight black streamers as creepy legs. For activities, set up a few spider-themed craft stations. At one, have kids make spiders using black paper plates and crimped construction paper. 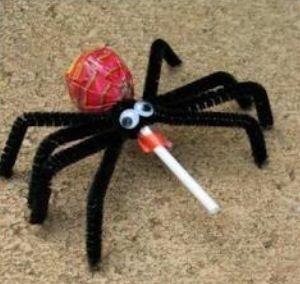 At the next, have everything for making arachnid-pops out of black pipe cleaners and lollipops. And at the last station, let kids customize their very own silly spider hat. For snacks, set out spooky spider eggs and ham-n-cheese spiders for a healthy dose of protein. 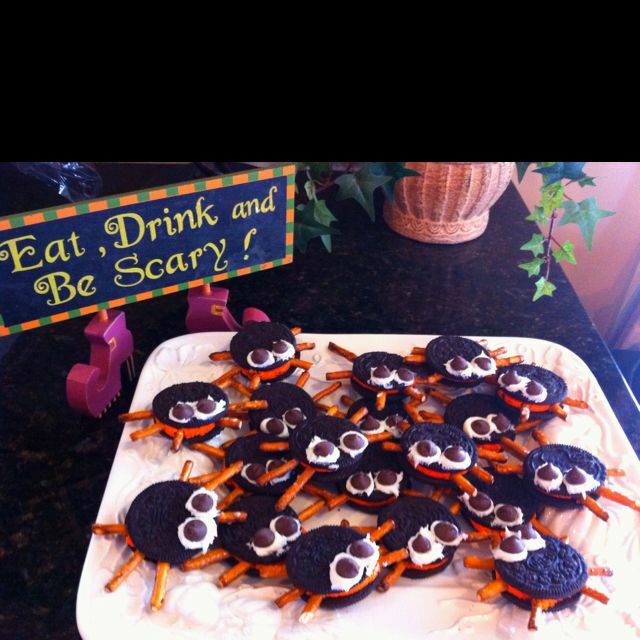 And for a super-sweet snack, serve up some spider cookies made from Halloween Oreos and pretzel sticks. Say thanks for dropping by with homemade goody bags filled with gummy spiders. Happy Halloween planning! Have a scary good time!